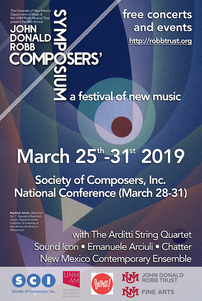 This year’s guest artists include the Arditti Quartet, Sound Icon, Emanuele Arciuli, Ingela Onstad, Chatter, and the New Mexico Contemporary Ensemble (NMCE). We are especially pleased to work with UNM Art Museum this year. Raymond Jonson’s image that was used for the poster art, will be on exhibit and there will be a small informal presentation following the Saturday, March 30 1 p.m. concert (ca. 2:15 p.m.). – Thursday, March 28 at 9:30 a.m. JD Robb Composers’ Symposium: Lecture Concert with New Music New Mexico (NMNM). – Thursday, March 28 – SCI Conference – free concerts at 2:00 p.m., 4:00 p.m., and 8:00 p.m.
Sunday, March 31 at 7:30 p.m. JD Robb Composers’ Symposium: Robb Concert including Robb Commission by Kyong Mee Choi, electronic pieces by JD Robb arranged by Micah Hood, and music by Steven Diaz, commissioned by Drs. Kim Fredenburgh and Kevin Vigneau that was just premiered by the artists in Granada. This concert is followed by a reception.